Rack em up! 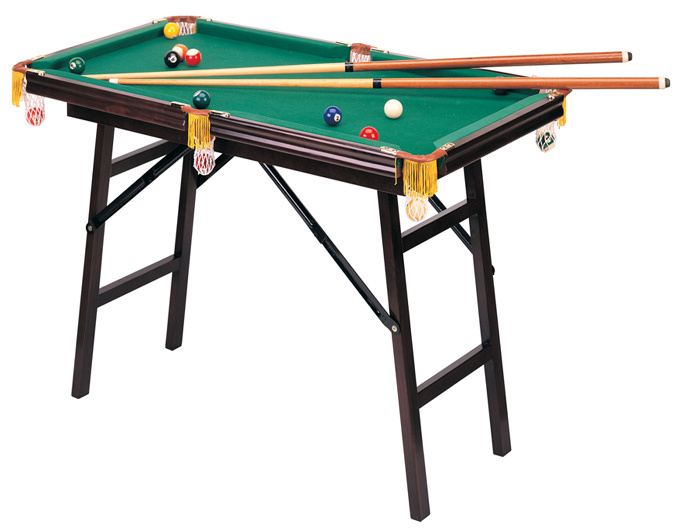 This compact portable Mini Pool Table provides for hours of playing fun for family and friends. Compact design and folding legs allow for quick and easy storage when not in use. Take it along with you for a game of pool virtually anywhere. Features solid wood contruction for stable game play, a tournament style green felt top and side pockets finished with white pouches contrasted with yellow tassles. The table comes complete weighted miniature pool balls, two 36 inch pool cues, a brush for cleaning and maintaining the playing surface, chalk cubes and a Ball Rack. The table measures 44.5" inches in length, 25" inches in width and is 29.5" inches tall. This table brings all the excitement of larger Pool tables at a fraction of the cost! Pick one up today!